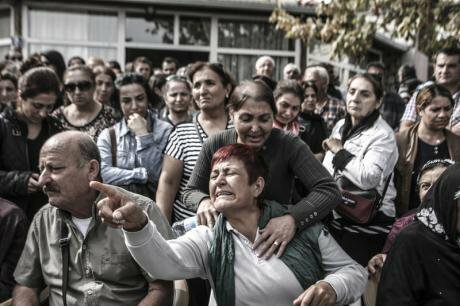 Blast victims' funeral in Ankara, October 11. Demotix/Recep Yilmaz.All rights reserved.There is something fundamentally wrong with the journalistic coverage of the twin blasts at a peace rally in Ankara – the deadliest terror attack on Turkish soil – which left more than a hundred people dead (128 according to the unofficial tally of the People’s Democracy Party, HDP) and several hundred wounded, and an almost ‘anomic’ country behind. As if writing a detective story or crime novel, most commentators begin by asking the ‘who’ question, religiously following the basic rules of the genre and creating suspense for the sensation-seeking audience - for the killer is usually unknown until well after the initial investigation is completed. This is the burden of Simon Tisdall’s otherwise insightful commentary on the Ankara attacks in The Guardian which points to the Islamic State, the ultra-nationalist Grey Wolves or other right-wing groups within Turkey’s security apparatus as the most likely culprits. One can add, as the caretaker Prime Minister Ahmet Davutoglu did, the PKK, the left-wing DHKP-C to this list, not to mention foreign intelligence agencies for the conspiracy-minded. Yet the question is redundant, if not entirely spurious, considering the immediate and the broader context in which the bombing took place. Put differently, does it matter whether the butler or the sister-in-law is the killer if it is possible to infiltrate a rally which takes place at the heart of the capital city, a few kilometers away from the headquarters of the National Intelligence Agency, undetected and blow oneself up? If the riot police arrives at the crime scene “after” the explosions, only to disperse the crowd who is trying to help the wounded with water cannons and pepper gas as well as blocking the entry of ambulances for almost half an hour? If the Ministry of Health says there is no blood shortage when social media is exploding with calls from the survivors, the relatives of the wounded and the health personnel for donors to rush to hospitals (in passing, let us note that the Turkish Medical Association was one of the organizers of the peace rally)? If the caretaker Minister of Interior states, smiling at the cameras, that there was no security deficit? If the leading figures of the political party which has been ruling the country singlehandedly for the last 13 years, and their professional or voluntary social media trolls immediately start blaming the opposition, notably the HDP which lost several of its members in the blasts, for the attacks before even being able to give a precise number of the victims? If that same government has been unable to bring the perpetrators of previous attacks, i.e. the terrorist attacks in HDP’s Diyarbakir rally in June 2015 or the Suruc massacre of July 2015, to justice? If in fact a famous mafia leader had just organized a meeting the day before the Ankara attacks where he declared that they will spill the blood of the terrorists, that they will “fill rivers with blood” before asking for support for the ruling party and its leader President Erdogan in the forthcoming national elections? Or, rather than asking these rhetorical questions, I would focus on the big picture and begin with President Erdogan’s post-bombing speech. “I strongly condemn this heinous attack” said a defiant Erdogan, which “is taking aim at our unity, brotherhood and future”. The problem with this standard, banal condemnation is not hard to spot, even for those who are not particularly well-versed in the intricacies of Turkish politics. Turkey has never been as divided and polarized as it has been in the last few years of Erdogan’s rule. True, unity, brotherhood (sic) and a belief in a common future are the defining features of a nation, even more so that of the Turkish nation which has been marked with an excessive obsession with homogeneity and unity since its inception in 1923. It is no coincidence that the preamble of the current constitution of Turkey starts with the words, “Affirming the eternal existence of the Turkish Motherland and Nation and the indivisible unity of the Sublime Turkish State…”, unequivocally stating that “no protection shall be accorded to an activity contrary to Turkish national interests, Turkish existence and the principle of its indivisibility with its State and territory, historical and moral values of Turkishness” (emphases mine). Of course, the unity the founders of the republic here envisaged did not square with the realities on the ground, and vast amounts of energy and, indeed, blood had to be expended over the course of the twentieth century to turn the heterogeneous population into “Turks”. Yet the faultlines that criss-crossed the society have proved resilient, leaving their imprint on – and in most cases aggravating – every major crisis the country has faced throughout its 90 years old existence. Not that it has always been rough sailing. There were times when hopes for the peaceful accommodation of diversity were raised, brief moments of respite when the future looked brighter and the will for more democracy stronger. In fact, the last of these moments was experienced during the rule of none other than Erdogan when his Justice and Development Party (AKP) embarked on a peace process with the Kurds, the so-called “democratic opening” process which lasted in fits and starts until the beginning of 2015. True, the reforms the state undertook were more cosmetic than concrete; the process itself was top-down, opaque and subject to the whims of two “men”, Erdogan and Abdullah Öcalan, the incarcerated leader of the PKK. Yet the ceasefire between Turkish armed forces and the PKK lasted more than two years, and many believed that the process was irreversible, whatever the (real) intentions of the actors involved. In the long-run, it probably is irreversible. That it was not in the short-run has been proven by the events that have unfolded since the collapse of the ceasefire in the wake of the now defunct June 7 elections. What is more, it is not only the Kurds that the AKP and its unquestioned leader Erdogan have alienated. Trampling on every faultline that divides the society, the AKP has managed to turn the liberals, leftists, ultra-nationalists (of all hues), Alevis, secularists, other political Islamists (including its one-time ally, the Gulen community) against itself, running the country relying only on a loyal constituency which is still enough to give it a majority in the parliament. But the country it runs is not the country it took over in 2002. “The rusty wire that holds the cork that keeps the anger in” (be it the army, or common ideals, common symbols – you name it), to borrow from the lyrics of a famous Pink Floyd song, is no longer there. The armageddon, if it has not already happened at Gezi or Suruc, or indeed Ankara, is nearby. The bottom line may not be pleasant to hear for some, but it needs to be said out loud: what we have been witnessing in the last couple of years, the culmination of which were the horrible scenes we were exposed to on 10 October in Ankara, is the end of the Turkish Republic as we know it. This does not mean that the territorial integrity of the country will be forfeited. But the anger that pits half of the society against the other is too intense, the divisions that run through various ethnic, religious or ideological groups are too deep to paper over. Moreover, as I have alluded to above, the quest of the Kurds for the full recognition of their identity and rights, especially in the context of the developments in Iraq and Syria, is in the long-run irreversible. Whatever the results of the forthcoming November 1 elections (assuming that they will be held), Turkey will embark on a long and possibly painful journey to a “less unitary”, less centralized system. On 10 October, Simon Tisdall observes in the article I have mentioned earlier, “Turkey, suffering the impact of the worst ever terror outrage on its soil, is a nation in shock. But it is also a nation living in fear.” Unfortunately, Tisdall is wrong, for Turkey is not a nation in the conventional sense of the term any more.